Budget 2017: With polls nearing, will Uttar Pradesh's farm sector, industry get a boost? Golden Globes 2017: Does Priyanka Chopra's red carpet look get a yay or nay? Live scores and updates of IPL 7 match between Sunrisers Hyderabad and Delhi Daredevils. Sunrisers Hyderabad lock horns with Delhi Daredevils at Dubai International Cricket Stadium. The match starts at 4 pm IST. Follow this link for live scores and updates. 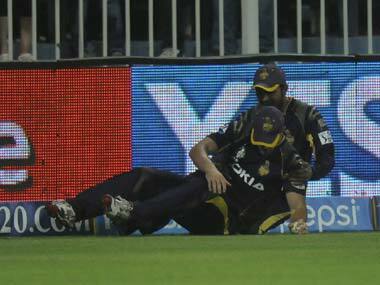 FirstpostChris Lynn scored 45 runs and took a vital catch as KKR beat RCB by two runs. FirstpostThe 24-year-old Lynn was making his IPL debut in this game and had already helped dig KKR out of trouble with the bat by making 45 from 31 balls and sharing in an 80-run partnership with Jacques Kallis. Sunrisers Hyderabad have had a poor start to the season losing both their matches so far, they need to up the ante this time around and get off the mark on the table. Just like the last season, it's their batsmen who have faltered. 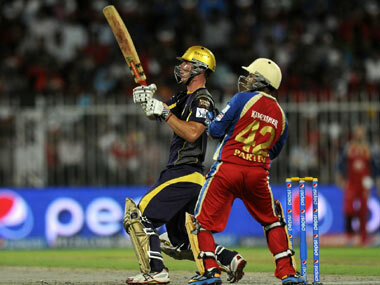 Though, in the last match, their bowlers too went for a plenty against Kings XI Punjab. They need a strong all-round effort today! Delhi Daredevils, on the other hand, have been inconsistent in the tournament so far. They lost the first match, won the second and again lost the third. They would aim for a win and get back on track. It seemed like Delhi were missing the services of skipper Kevin Pietersen and they might just receive a huge boost as the skipper might be fit in time to make his first appearance in this game. TV footage show him warming up!!! Shikhar Dhawan says that once their batsmen get going it's going to be hard for the opposition! Well, well! Kevin Pietersen has made his way out in the middle for the toss! Pietersen says that it's been frustrating but it's good to get out on the park. He adds that they need to get the momentum going with a win! Sunrisers Hyderabad have won the toss and elected to bat! Dhawan says that the wicket looks dry and they are looking to post a big total and then try and defend it. Pietersen says that he was 50-50 and is glad that he lost the toss! Ross Taylor misses out, Quinton de Kock, Kevin Pietersen, JP Duminy and Wayne Parnell are the four overseas players for DD! DD XI: Vijay, de Kock, D Karthik, Pietersen, Duminy, M Tiwary, L Shukla, W Parnell, S Nadeem, Shami, Unadkat. SRH XI: Finch, Dhawan, Warner, K Rahul, Sammy, Venugopal Rao, K Sharma, N Ojha, Steyn, A Mishra, B Kumar. 18 runs off the Mishra over! 31 needed off 12 balls! Steyn will bowl the penultimate over. FOUR! Brilliantly done by Tiwary! Gets across and paddles Steyn wide of short fine leg for a boundary. 27 needed off 10! FOUR! Duminy is in form of his life! Short and wide outside off, Duminy cuts it over point. Just a single off the next delivery! 21 needed off 7 balls! Tiwary Gets an outside edge to third man for just a single. 20 runs needed off the last over! Bhuvneshwar Kumar will bowl the final over. Can Manoj Tiwary and JP Duminy power DD past the finish line? Just a single off the first ball, wide outside off, Tiwary mistimes his slash to extra cover. Brilliant delivery. Yorker length delivery outside off, Duminy misses his swing across the line. It hits his boot and they run through for a leg bye. FOUR! 14 needed from 3. Tiwary uses his feet and smashes it over point. Just a single off the next ball and Tiwary drives it to long off. 13 needed off 2 now. Are we in for a super over here? SIX! Are we in for a Super Over here? Duminy plunders a low full toss over long off. 7 needed off 1! That's it! Sunrisers Hyderabad win by 4 runs. It's very full outside off, Duminy drills it to long off for just a couple. A brilliant bowling effort from SRH. DD got off to a spectacular start but then SRH pulled things back, held their nerves and won the match!